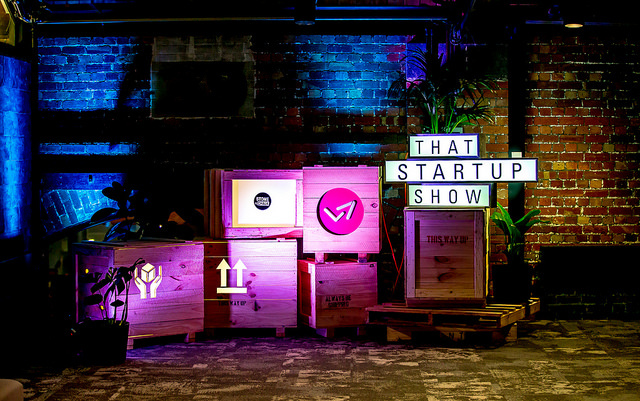 Australia’s no1 show about startup culture, That Startup Show, is an award winning live/online TV series focusing on the entrepreneurial boom. Rebooting this July, the team at TSUS called us in to launch the event surrounding first episode of the series, and assist in building the creative. Also the home of Launch Vic and Stone & Chalk, the newly renovated historic "Goods Shed" at 710 Collins Street, was established in 1889 as a huge railway freight shed. The shed used a system of lightweight wrought-iron roof trusses, heavy cast-iron columns and brick outer walls to house freight, and meet increased freight demand and boom years of the 1880s. .
Our brief was to create and build the audience event area and creative elements of That Start-Up Show's pop-up studio, also adding custom elements and enhance the lighting, and consider the aesthetics of the building. We called in builders SupaDupa Industries, who share a common interest in recycling, repairing and affordability in construction, to work with us to build the custom elements including a light box illuminated desk, a pitch ring, and a custom designed, cost effective bar which reflected the history of the building in which their pop-up TV studio is now produced. 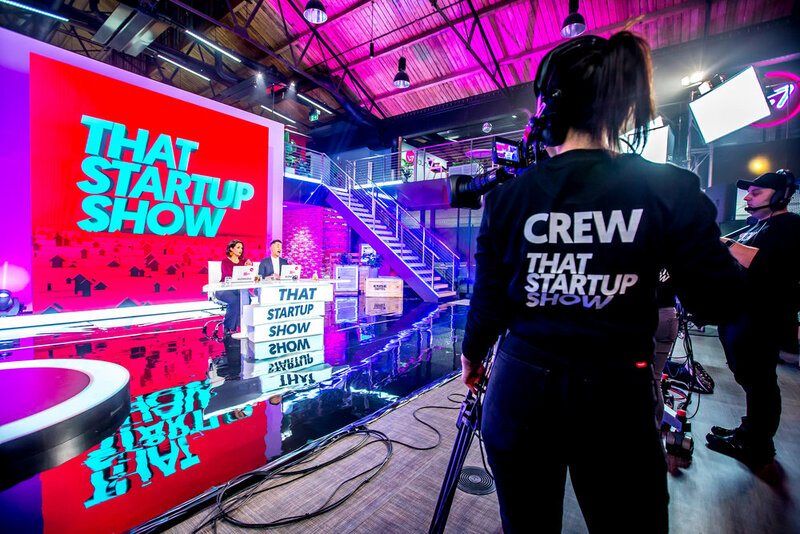 Add lighting designers, John Fish, to the mix and the custom elements, studio set and the surrounds of the space shone a light on the show (excuse the pun) - we also turned on a little hazer to set the mood. 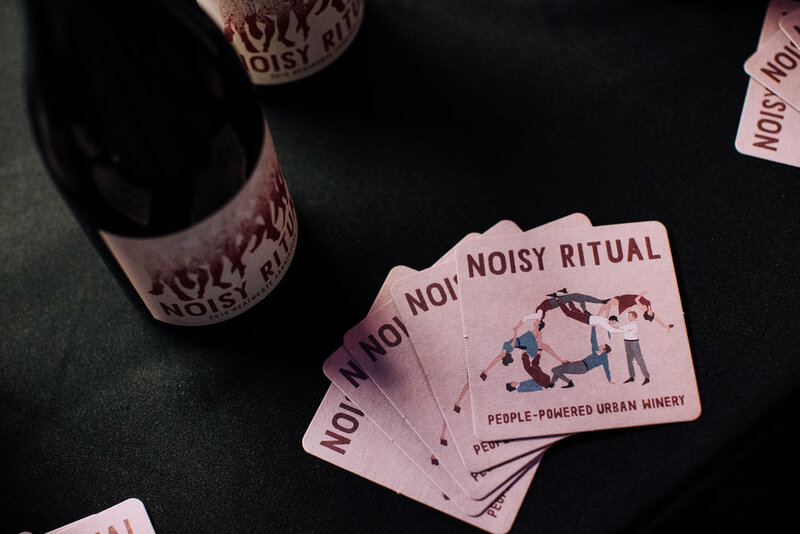 We kicked off the StartUp Season, and officially launched the building as guests got stuck into Espresso Martinis. 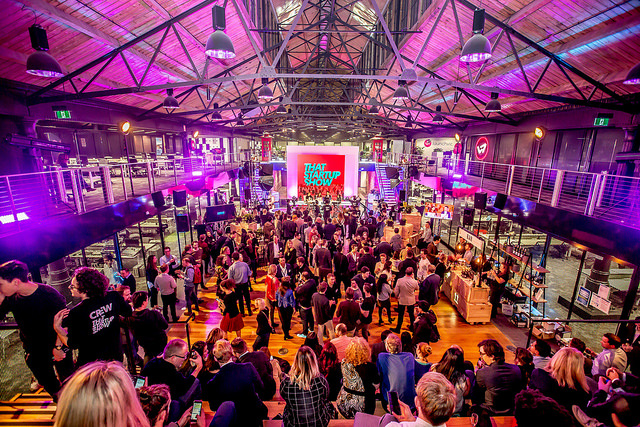 Fun Fact: The Goods Shed was also a semi-legal rave venue back in the 90s and home of the Melbourne shuffle. "Techno", still reigns - just in a very different form. 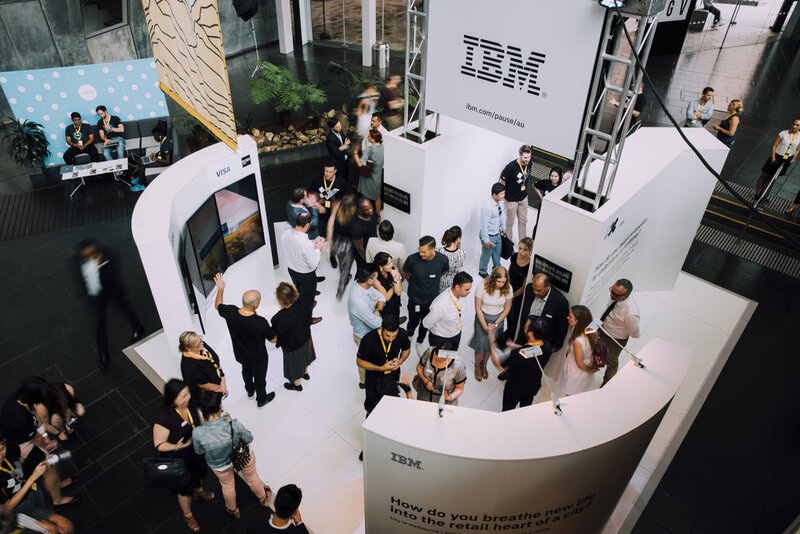 Pause is Australia's premier creative, tech and business event. Held across five sites at FedSquare for 3 days, plus a retreat down the Great Ocean Road, Pause is a catalyst for change, a uniter of all industries, and a platform for the future, bringing the world’s foremost thought leaders like Airbnb, NASA, Netflix, Who Gives a Crap, Fast Company, Girls in Tech, This American Life, SXSW, Pixar and Canva together with local heroes, for one unforgettably action-packed event. From designing the event aesthetic, establishing the world's first NFC chipped attendees, implementing a corresponding ticketing system, navigating travel and accommodation for speakers across the globe and hooking up our client with fantastic partnerships such as Mountain Goat, Noisy Ritual, Starward Whisky, QT Hotel, Dann Event Hire, WeWork + more, as the creative production agency for the event, not only did we run every aspect of the conference itself, including activating brands such as Xero and IBM, creating a chill space complete with Billy Van Creamy and Wide Open Road, but we extended this years program to bring a series of sensational parties and side-events. The 2018 program extended to include an Opening Party, plus a slew of smashing events including private event and SXSW meet at Mountain Goat Brewery, a fancy dinner at Pascale Bar and Grill at boutique venue at QT Hotel, a breakfast with views from Taxi Kitchen and a pumping party at Chapter House with DJ MzRizk, Cool Out Sun and an exclusive VR performance by comic artist and interactive designer, Sutu. Our little team of 4 people completely led the way, to smash this event out of the ball park, setting the standard for the future. Thanks to all of our Sidekicker crew + vollies who were amazing. It's fair to say it was a very hectic four days of power. Ask us for a case study.